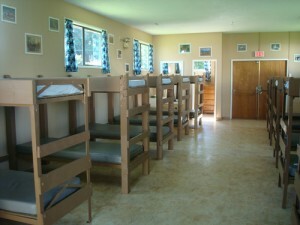 When the campers arrive, they are shown to their cabins by one of our staff members. The girls and boys sleep in separate cabins with our trained leaders in adjoining rooms. Once everyone has arrived, the camp director explains the rules and introduces all the staff members. 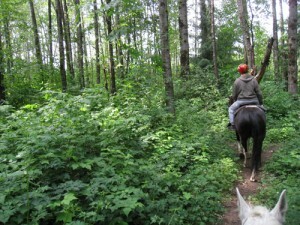 We also go for a walk up to see the horses (check-in day is their day off), and then have campfire and an evening snack. Every morning, our campers and staff begin the day with breakfast, which always includes fruit and juice. Once finished, they return to their dorms to begin dorm clean-up. Each dorm is then inspected and the worst dorm gets kitchen duty (wiping down the tables after lunch, dinner, and the following breakfast). Morning activities begin on the first full day with campers split into their riding groups. They will stay in these groups for the entire week for activities such as riding or team games. Friends will stick together, and we try to ensure a variety of ages and riding skills are in each group. 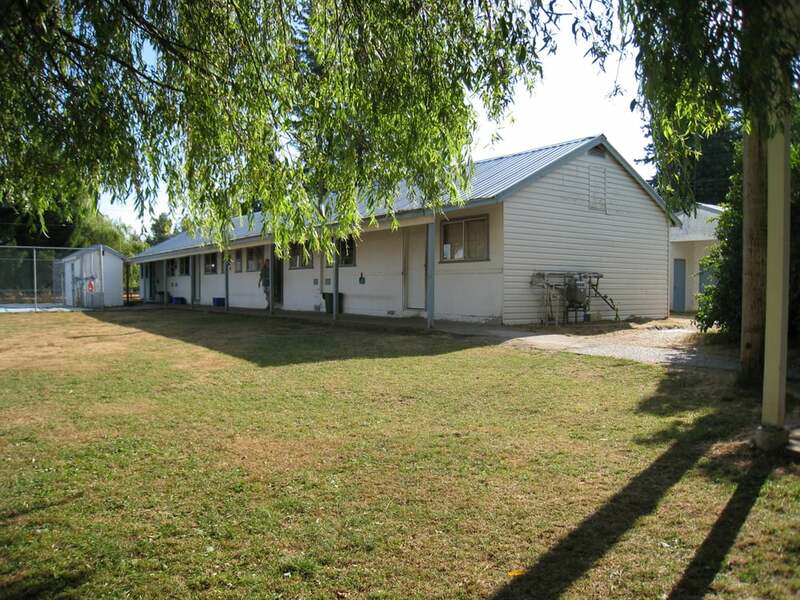 Every morning after dorm inspection, one group goes directly to the barn to ride. The riding order changes daily, so each group will have a chance to ride first, midday, and last during the week. The groups who are not riding will participate in a large group activity in the morning, such as California Kick-Ball or Freeze Tag. At the barn, campers are taught the basics of riding, grooming, saddling, and handling of the horses. We show them the parts of the horse and they get to try tacking up. On the first day, everyone will stay on the half-mile track, riding several different horses and switching with other campers. Later that first day, our skilled staff assign each camper a horse for the week (or if they’ve been here before, some get to pick which one they want). On subsequent riding blocks, the horses will be tacked by staff members and ready for riding. Campers will be able to choose if they want to stay on the track or go on the trails. If they choose to go on a trail ride, they will be led by a senior staff member who is equipped with a two-way radio and first aid kit. The trails are all on camp property, surrounded by fences on all sides. During the day, the campers get to make their own choices of what they want to do. The only requirement is they need to ride with their riding group if they want to ride that day. 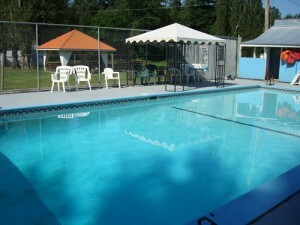 They can go swimming in our heated outdoor pool (with qualified lifeguard), do arts and crafts, play games, groom horses, go on nature walks, or visit the petting zoo. 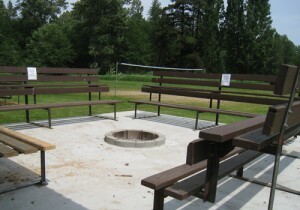 Or they can relax in the shade and play card games with the many friends they meet during the week. All activities are supervised by our camp leaders and senior staff members. There are three meals during the day, as well as an evening snack and afternoon canteen. Each meal is served in our dining room, prepared by kitchen staff in our full service kitchen. Our kitchen is inspected regularly and licensed to appropriate FoodSafe standards. An example of our lunch menu is soup (with vegetarian option available) and choice of sandwiches (tuna, egg salad, or peanut butter and jelly). Our weekly dinner menu will include spaghetti (non-meat available) at least one night for our traditional Monk’s Dinner. Other menu staples are macaroni and cheese with salad (dinner), grilled cheese and carrot sticks (lunch), and chicken, rice, and corn (dinner, with vegetarian substitutions available). Canteen (our candy store) is open once per day for each group. Campers can use their money credits to purchase treats and snacks. Canteen credits are divided over the course of the week with leftovers rolled over daily, and any unused amounts returned to the campers at the end of the week. The last group rides before dinner (both people and horses). After dinner, and once the horses are let out for the evening, we have evening activities. These can range from Capture the Flag, skits and talent shows like “Webb’s Holiday Idol”, our weekly Sports Day tournament, and scavenger hunts. After our group evening activity, we all gather around the campfire for a sing-along and snack. On the last night, we have Kangaroo Kourt followed by the Dance. Kangaroo Kourt is presided over by a Judge who rewards good deeds and “punishes” naughty ones—but don’t worry, it’s all in good fun. The music played at the dance is a mixture of fun dance songs (like “Macarena”), good ol’ Country tunes (like “Man! I Feel Like a Woman!”), as well as the clean radio edit versions of Top 40 pop songs. After breakfast, instead of dorm inspection, every camper packs up their things and helps clean the dorm. All luggage and sleeping gear are brought to the gymnasium to await pick-up. Before lunch, we all walk-up to visit the horses, take photos, and say goodbye. Also, make sure to exchange email addresses and phone numbers with your new friends—the camp is not allowed to share any information about campers. Pick-up will begin after lunch. If someone other than the camper’s parents/guardians will be picking them up, please let the camp director know beforehand.